In a new segment, Jefe will bring rare artifacts (or just plain junk) that shaped our lives from long ago and see if gente ‘members them. First on the docket is the apple soda, Aspen. How many of you ‘member the great taste of that soda? Before Jefe was a Dr. Pepper junkie, he was all about the Aspen. I was drinking Martinelli’s carbonated Sparkling Cider and thinking how good Aspen Apple Soda used to be, for a fraction of the cost. I wish it was still around. You and me both, John! I so wish Aspen was still around…even if I was the only one buying their product to keep business going! Martinelli’s is good but I yearn (watcha, big word) for the days of Aspen Soda. I’m laughing myself silly about this. There was a huge advertising campaign leading up to the introduction of this soda. “Aspen is Coming!” was plastered all over Philadelphia; in magazines. on billboards, even inside subways and buses. The ads featured a very handsome Patrick Wayne, son of John Wayne, along with a beautiful woman, both dressed up in expensive looking apres ski gear, but there was absolutely no explanation for what Aspen was. These ads ran for what I recall as being several weeks or even a couple of months, with everyone wondering what Aspen could possibly be. When Aspen finally hit the stores, naturally the intense curiosity led people to try at last this incredible and amazing product. While I do remember thinking, “All this for a dumb soda?”, I also wanted to try it. My reaction was much the opposite of John’s and L. Jefe’s. I didn’t like it. Not at all. It just didn’t taste good, and most of my friends felt the same way. Plus, we kind of felt we’d fallen for some dirty trick concocted by the advertising agency that handled Aspen’s campaign, and didn’t want to buy it because of that. Maybe a lot of other people disliked it as well. Wikipedia says it only lasted for 4 years before it was taken off the market. I worked at a retail store in 1978 when Aspen showed up. We loved it. I read that it was re-branded by Pepsi as part of the SLICE line, which was discontinued a few years back. 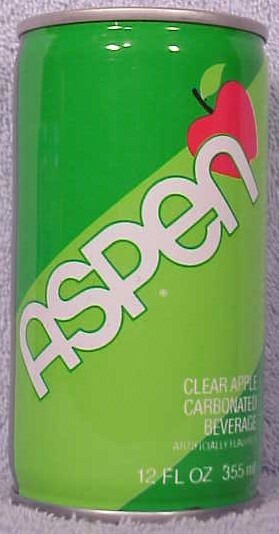 Aspen was a great, refreshing soda. I think about it often and wish Pepsi would make it again. The only other refreshing soda I enjoy is Fresca, but I avoid it now because of the aspartame sweetener in it. Now I drink the carbonated water family (BUBLY, Le Croix) just for the fiz and to avoid the chemical sweeteners.